On behalf of the coaching team, we want to thank all of the athletes who made the weekly effort to come down to the track and participate. We hope that for next year there will be improvement and advantage for all athletes who choose to join and come along to little athletics training. We hope that our coaching was beneficial to you and most importantly, that you had fun ! Thank you for a great season; see you in the 15/16 season. 17/02/15 - Come along to training tomorrow for any last minute training tips before regionals.The coaches will be there ready to have 30 minute coaching in Long Jump, Triple Jump, High jump, Shot Put, Discus, Hurdles and Sprints. We will have our group warm up and a choice of two events. We hope to see you there! Welcome back and see you for some handcap racing and learn how to run to your best in this very exciting form of the sport. Kate is very experienced in professional racing so come along and get the inside running.! 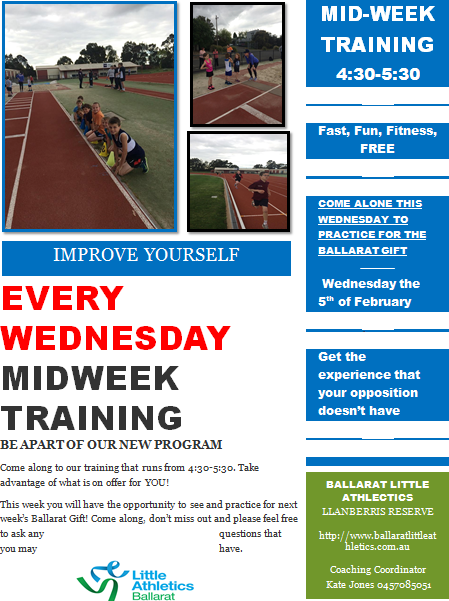 Athlete coaching (and parent training in the basics needed to oversee Saturday morning competition), is a key aspect of Little Athletics Ballarat. Midweek training for athletes is included in the registration fee and is designed for all skill levels and ages. Athletics is fun, and our training reflects this with dynamic warm up, lots of (skill based) games and specialist skill advice for the event coming up next week to give you the edge needed for that PB ! Kate Jones (Mobile 0457 085 051 Email katelynjones@students.federation.edu.au) is the Coaching Co-ordinator and is very passionate about helping every athlete achieve their personal best. As well as midweek training, the Saturday morning competition includes Event coaching and a Hotline service. So,if a coach is there; don't be shy; feel free to ask questions and if there is no coach there and you need help. then CALL A COACH on the HOTLINE 0457 085 051. Here are the basic techniques for our events. Coaches use these as a base to encourage, instruct and train athletes to improve and perform to their very best. We provide training for parents (which will equip you with the knowledge to conduct an event correctly, even for Regional and State Championship Officials duties), but we can provide funding or reimbursement if you want to become qualified and join the coaching staff. We fund your completion of the (Introduction to Coaching Course) ITCC. Please CLICK HERE for details and booking. Have a look at the 2014/2015 Coaching Plan and let us know what you think. Your ideas and feedback will be included in our end of season review and considered in next seasons planning.